Make your way to Badrinath. Walk three kilometres to the last inhabited Indian village, Mana. If there are no panchayat elections happening on the day, you might just be lucky enough to hop on a local bus or jeep. I wasn’t. Beyond this village there is nothing but snow-capped mountains. No habitation, just no-man’s land and then the china border. Walk through the village, up towards Vyas Gufa (the cave where Vyasa is supposed to have dictated the Mahabharata to Ganesha). And there, at the edge of Mana you will see one of the most memorable places I visited – and one of the more interesting people I met – during my month-and-a-half sojourn. Meet Chandra Singh Barhwal. 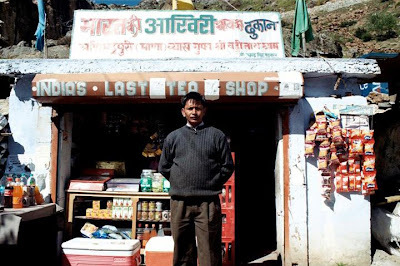 Proud owner of India’s Last Tea Shop, and a brewer of one mean cup of chai. *Himani, if tea's your thing you should go. he's got this special chai made with tea leaves, tulsi and some herbs. is awesome. i bought meself a coupla packets of that. he makes it himself. try and go, walk up - it's more fun. bon voyage and cheers.